We're increasingly seeing companies specializing in motor vehicle systems enter the cycling industry. One of the obvious perks of this trend is that some fresh ideas are being dragged along into the cycling scene! 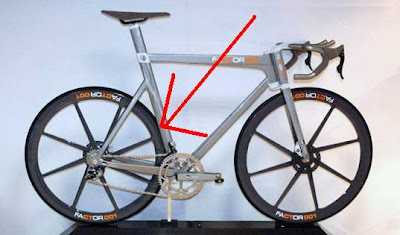 Only a few weeks back, I had posted in depth about an ex-McLaren engineer's 'Thixomolded' magnesium folding bike. That is a world's first. Click here to read if you missed it. What is making wild news at the moment is the Factor 001 bike designed by one of the suppliers of racing systems to the motorsport world, UK based Beru f1 Systems. Beru specializes in advanced design and manufacturing facilites for vehicle wiring harnesses, tyre pressure monitoring systems, stress measurement and load cells, with electronics and composites also as part of their business. Multi-channel Electronics Package : Provides unique ergonometric data collection (science of human-machine interaction optimization), logging and analysis capabilities which can correlate biometric data from the rider. It also measures physical force data from the bike and environmental data. All this has been supposedly developed with feedback from professional athletes. Carbon Ceramic Brakes : I quote them as saying that this affords "exact braking performance at any temperature". Fully Integrated Structure : Using BERU f1systems’ Wire-in-Composite patented technology; load sensors, wiring, batteries, sensors, control cables and lines for the hydraulic braking system are all fully integrated into the composite during construction, to give a clean, uncluttered appearance to the bike. Heart rate, GPS coordinates and torsional stresses on the frame among other data are displayed on a touchscreen panel built into the handlebars. 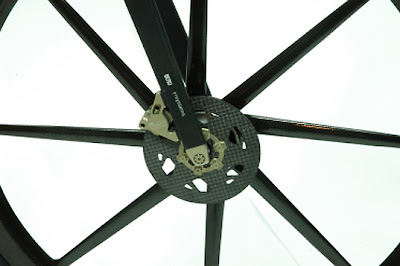 Monocoque Composite Wheels : 8-spoke monocoque composite wheels deliver high lateral stiffness and robustness, for, I quote them - "everyday use". Made To Measure Frame : Bespoke made-to-measure frame (to within 1mm). Twin-spar frame reduces sideways frame flex and preserves rider comfort. Complete bike will weigh in under 7kg. All In-House Manufacturing : Almost all original parts and key components are designed and manufactured in-house from Formula One-grade materials. 1) Specialized, Scientific Tool : That this is a highly specialized, scientific bike is without doubt in my mind. All the fresh ideas coming out of this F1 company is good for the industry. It'll get people to put on their thinking caps to start competing in the market. But I don't feel it can become a mainstream design. Frankly, all this instrumentation could be overkill for most racing bicyclists. Unless you're really obsessed with numbers, most of us cyclists hardly have the time to spend as lab rats. So this design may only be focused on a small section of the market. 2) Cost : As if that's not enough, the $28,000 price tag will have you double checking your purchasing choice. I'm not sure why having an 'on board computer' is being touted here as a striking feature. Cycling computers are hardly a new phenomena. And SRM, Powertap and other measurement devices exist in the market that are far cheaper to integrate with an existing bike for measurement (heart rate & power). So I think the key to thinking about this bike is this : How much more efficient in your cycling will you become (as opposed to now) with a $28,000 fully tricked out scientific lab on wheels? And will you see tangible benefits in performance to actually have your investment sort of pay itself over time? "The Factor 001 is not designed for UCI sanctioned mass-start races - Just as a car such as a Bugatti Veyron isn't designed with FIA regulations in mind. So super-quick wheel changes take a back seat to having the best braking option. It is a fast road machine rather than a 'racing' bike. The frame 'architecture' was arrived at simply because it offers the best lateral stiffness with the least mass, not to fit with UCI regulations (which it wouldn't in any case - the press release shots don't show very much at this stage)." The wheel changing issue is true. If you carefully observe the rear portion of the bike, the tire/wheel is partially enveloped by what seems like a groove, or channel in the seat tube. Seeing latest pictures of the bike from a different angle, the seat tube has a bifurcation into which a part of the wheel sits in. This design feature escapes me and it may be just for style, or aerodynamics, but it brings about its own issues. The design may not be compatible with tires wider than 23c which could preclude its flexibility to riding variety. 4) Manufacturer Expertise : The makers of the bike have been traditionally knee deep in the F1 scene, working with electronic monitoring systems and composites. They may know motor vehicles but they are new in the cycling scene. Whether they know a thing or two about what makes cyclists tick, issues relating to fit and comfort, and whether they possess the knowhow of designing a stable riding bike are really questions open in the air right now. Here's a BBC video of the launching of the bike at the Science Museum in London. Composite wheels for everyday use? Wait a minute. I smell something fishy. I'm a recent visitor to your blog. I'm simply beyond words to describe the class of material you put on here. Keep up the good work! When the economy is in shambles like we're in now, I can't imagine who in his right mind would want a 50,000 dollar Cadillac or a 30,000 bicycle for god's sake! The manufacturers of this bike need to give themselves a reality check. How come you came to conclusion that it has power output. I only see facility for heart rate and gps in features. If such expensive bike does not have power reading, it is a big shame.